If you’re a writer, your career path will be less like climbing a corporate ladder and more like bushwhacking through an untamed jungle. Every writer must make his or her own unique career decisions, because every writer has a distinct destination in mind. At Writer’s Relief, we know there is no single cookie-cutter path toward one universally agreed-upon idea of success in the publishing industry. What does success look like to you as a writer? And how much money will you make as a writer if you achieve this success? Will your career as a writer be guided by a 50/50 interest in profitability and passion? Or is the amount of money you make as a writer a distant second to having the freedom to write whatever you want to write? Or maybe you feel flexible about the kinds of stories you tell, and you’re willing to write for the market in order to maximize book sales—but only to an extent. 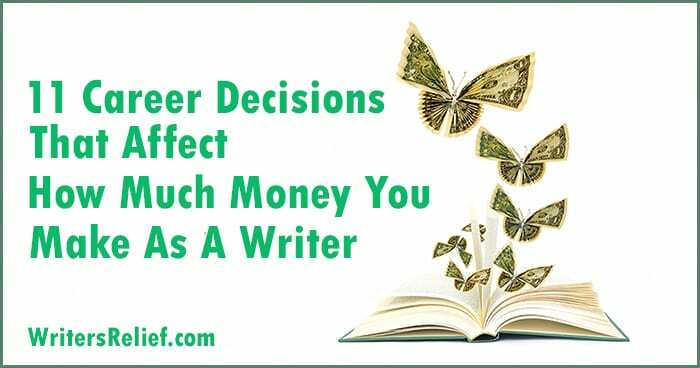 As a writer, you will inevitably run into hard choices that are going to affect the amount of money that you might be able to earn through your creative writing. First, we are going to take a look at some of the fork-in-the-road decisions writers face when they are trying to plan a career in an industry that is filled with uncontrollable variables. Then we’ll talk about some methods that will help you make decisions that will guide you toward the happily-ever-after of your writing life. Choice of genre. For many writers, choosing a genre is not a career decision; it’s a calling. But if you do feel like you have some creative flexibility, you may want to do some research to discover which book genres make the most money. Whether you write in a single genre or frequently jump around. Writers who prioritize the creative flexibility of being able to jump between book genres may not have the brand-building power of writers who pick one genre and stick with it. Why? Although some fans may be willing to follow an author from one genre to another, research indicates that many readers will not. An MFA. The decision to get an MFA (or not) can profoundly affect the financial outlook of your life. An MFA in writing is expensive—from $50,000 to much more. That’s money you could invest in self-publishing, marketing, or personal-life enhancements (like a house or retirement). Writers who seek an MFA degree can score networking opportunities, improve their craft, and gain the credentials they need to teach at the collegiate level. That said, the decision to earn an MFA might change your future decisions about your job choice, since you’ll likely be saddled with lots of student debt. Maintaining a strong, lifelong submission strategy. Getting your writing out into the world for consideration is one of the most important things you can do for your writing career. Here are 33 reasons submitting your writing to literary magazines can give your writing career a boost. Your writing can create opportunities for you—but only if you are regularly sending it out for submissions. Your ability to build a strong submission strategy is a key factor in your future within the publishing industry. Investing in submission strategy assistance. Writers who find that they are unable to focus enough of their energy on the time-consuming work of researching and making submissions may find themselves making the career-changing choice of hiring a submission strategy assistant. For some writers, the difference between having help making submissions and not having help is truly a career game-changer. “Writer’s Relief had a plan that changed everything for me. I worked harder because I had a goal every submission cycle and great people who held me accountable. I worked faster, following my intuition, making more leaps of faith in my poems. I was afraid of rejection at first, but with the volume of publications that Writer’s Relief was targeting for me (about 25 in a two-month cycle), I got used to it, and soon I learned to let “Thanks for your work, but…” roll off like water off a duck’s back. Quack! Signing with a literary agent. Because most literary agents take a 15% commission, some writers try to navigate traditional publishing without a literary agent for a partner. It’s widely believed that writers who are represented by good literary agents are offered more money from publishers than those who are not represented. Most literary agents will reject a publisher’s initial offer and negotiate for more. The better the negotiation skills of a literary agent, the more likely you may be to get a higher advance if you’re negotiating with a publisher for a traditional book deal. Whether you self-publish a book or seek traditional publication. The manner in which income flows to writers is vastly different from one publishing method to the other. Traditional publishers pay their writers up front, then offer a smaller percentage of royalties. Self-published authors pay their own way to release their book, but then they are able to net larger royalties. Your day job. Even if you never make a dime selling your poetry or short stories, you may be able to monetize your love of the written word by landing a soul-satisfying job that scratches your writing itch and makes some money. Here’s a list of great day jobs for creative writers! The ability to create luck. Serendipity can play a meaningful role in a writer’s career. But we don’t think “luck” happens by accident. Being in the right place at the right time—to meet a future agent, to score a new publication credit—is a direct result of actively seeking opportunities, as opposed to passively waiting for them to fall into your lap. Learn more about how to create more lucky opportunities for yourself as a writer. Emotional resilience. Writers face rejection letters on a regular basis, and for some writers, the emotional discomfort of this disappointment is enough to stop them from ever making a single dollar. We’ve written many articles on this blog about how a positive attitude is the backbone of a long writing career. And you can find many of them in our book, The Happy Writer. Returning to your love of writing (again and again). A writer may not be able to control rejection letters, reader responses, reviews, book sales, and the like. But through it all, writers who can find solace in their love for the written word may find they have the strength it takes to withstand the vagaries of a career in the publishing industry. If you feel like you’ve fallen out of love with writing, don’t worry: it happens to everyone. Learn more about how to rekindle the flame. It’s easy to compare apples to apples (or numbers to numbers). But comparing one career choice to another is much more complicated. Many diverse factors play into a writer’s career questions, which makes it difficult to find clear-cut answers. And having to make difficult decisions can cause lots of stress and anxiety in a writer’s life. Let’s check out a few ways that experts find workable solutions to the problems of decision-making. Some career coaches suggest using a decision matrix (also called the Pugh method) to help quantify a difficult decision. A decision matrix helps distill hazy notions into a clear hierarchy of scenarios so you can make a decision about which choice is best. In one column, list your career options (or whatever choices you are struggling with). The rows of your decision-making table feature the factors/characteristics that play into each one of your possible choices. Assign a number from 1 to 10 to each characteristic of your potential career option (with ten being very positive and zero being negative). When you’re done, add up the numbers to give each career choice a final score. Here’s an example of a decision matrix table that a creative writer might like to use. Writers can also make similar decision matrixes when they are trying to decide between one publisher and another (or between one publishing method and another). You may also find this decision-making method is helpful outside of your writing life when it comes to making investments, planning the future of your family, choosing between doctors, or weighing any difficult decisions. The Futures Wheel concept can help you weigh the pros and cons of individual decisions for your writing career. You can find many Futures Wheel templates on the Internet, or you can simply draw your own. Start with a circle, and write within it the name of the choice you are considering. Around this central circle, create a ring of smaller circles and list in them the immediate and direct consequences that would occur should you do the action you’re considering (the one listed in the center circle). Connect the center circle to each of these circles with a line, like the rays of the sun. Make another circle of small circles outside of your first ring; in these list the indirect consequences of your initial decision. Draw lines from the indirect consequences to connect them to the direct consequences. Futures Wheels can list both positive and negative consequences. Or you can make one wheel that focuses on positive consequences and another that focuses on negative. Tailor the concept in a way that will work for you. Here’s an example of how a creative writer might use the Futures Wheel method for decision-making. Say you would like to figure out whether you want to self-publish or whether you want to try to connect with a literary agent who can help you secure a traditional publisher. One direct consequence of choosing to self-publish would be paying out of pocket for publishing services. The indirect consequence would be not having that additional money in your pocket, which will affect where you will go on vacation next year. To utilize the Futures Wheel method for decision-making in your writing career, you will need to make one wheel for each possible decision. Don’t discount the power of an old-fashioned pros-and-cons list. There’s something very clarifying about seeing the pros and cons before you, set out in neat, simple columns. Create a dedicated T-chart for each of your possible options. Wish you had help making submissions? Reach out to Writer’s Relief! That’s what we’re here for—it’s what we do! Remember: It’s Never Too Late To Make A Change In Your Writing Career! And writers may find a lot of mobility within their writing careers. Writers who start out with a passion for poetry might find that they gravitate toward science fiction later in life—and that’s okay! When you follow your passion, when you write with your authentic voice, and when you have confidence in your craft, you may find that making a switch in the middle of your writing career is a recipe for professional and financial success. Writer, can you help us? Please share your experiences about making career decisions with the writers who are reading this article. What was the best career decision you ever made as a writer?